An outbound call is any call placed from a contact center agent to a third party, often a customer or prospect. Outbound calls are typically made on behalf of the contact center or their client to make sales, complete surveys, update customer information, or provide service. Automation is the most important ingredient in a streamlined outbound campaign. However strong your leads, however skilled your sales team, nothing matters if you can’t make calls at scale. 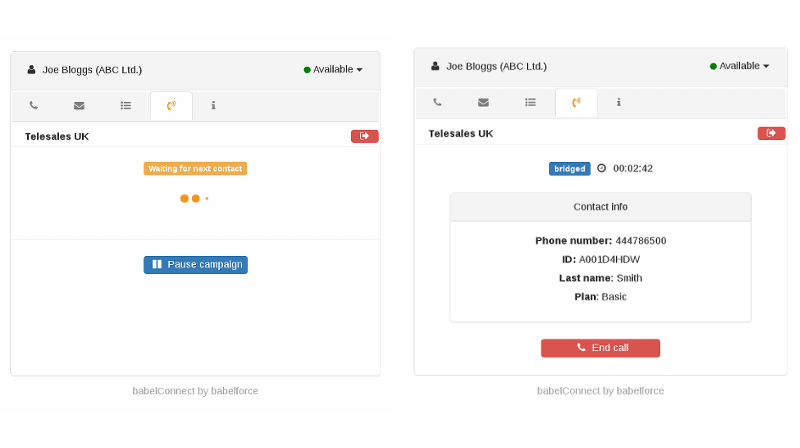 With the babelforce dialler predicting volume, connecting agents, and dialing multiple numbers per contact, you can increase your reach by thousands of leads per day. That leaves your staff free to concentrate on getting the most from every contact. A lot can happen during a call. So how can you make sure no follow-ups are missed. With fully integrated call data, it’s simple. Whether you need to update support tickets, send SMS, or recycle unanswered contacts, babelforce has it covered. By integrating deeply with resources like your CRM or Helpdesk, the babelforce platform can trigger any follow-up based on parameters that you define. Nothing matters like a first impression. And what’s the first impression you give your customers? Your call script? Your agents’ tone? It’s the caller ID that displays on their phone. Around three quarters of people will accept a call from a local number – almost the same number would reject a call with the number withheld. That’s why babelforce allows users to adapt their calling line identification (CLI) by selecting from a simple drop-down list. When there’s a simpler way to dial than with a single click, we’ll let you know; until then, our click-to-call function is the best there is. 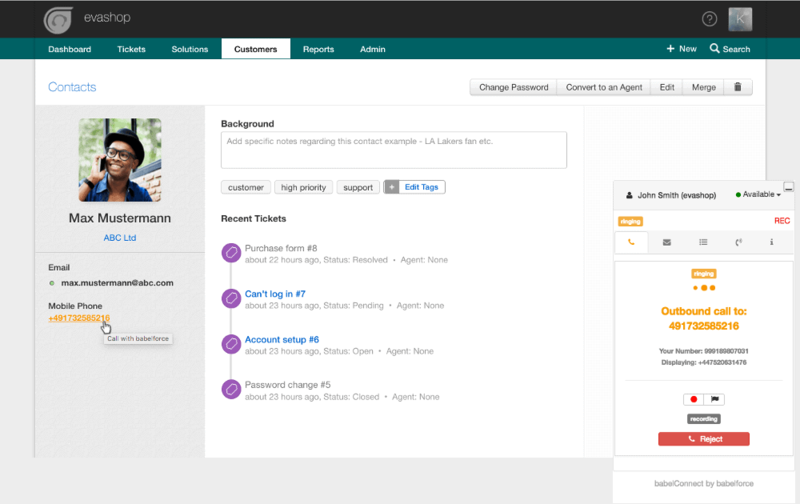 By integrating with in-house tools like your CRM or ticketing system, the babelConnect app keeps click-to-call on screen, wherever agents navigate. That’s the most flexible outbound service for sales or service any contact center can hope for.